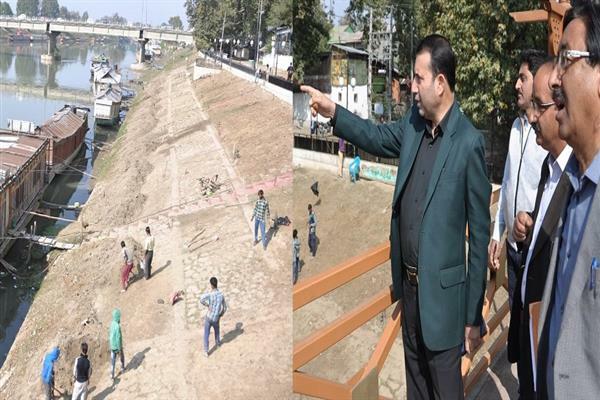 Srinagar, Oct 18 (KNS): Secretary PHE, I&FC, and DMRRR Farooq Ahmad Shah today toured Jhelum and Flood Spill Channels embankments at various places in Srinagar and took stock of pace of ongoing beautification works. During his visit, he directed officials of the Irrigation and Flood Control department to ban any kind of construction of roads on the sides of the bank, as they can weaken the embankments and cause other problems. He also directed that no any electric pole shall be installed on the banks of rivers and there should be a complete ban on laying of water piper on these banks. He said that these steps should be strictly implemented as there is an apprehension that water leakage from any of these pipes can weaken the bunds which in turn can prove dangerous during the times of high water level. He said that the department is committed to strengthen the entire embankments and no compromise will be tolerated in this regard. He said if any official or officer is found guilty of not following the orders, a strict action as per law will be initiated against him.